English visual artist Eleanor Mason, a cousin of the British writer E. A. W. Mason, was born in the U.K. in about 1895 and studied art in France, Germany and Italy. Eleanor, variously known as Eleanore, Leonore, Evylin or Evelyn, lived in Ajijic for a short time in the 1930s, as the wife of German cellist Alex von Mauch, one of the earliest long-term foreign residents of Ajijic. 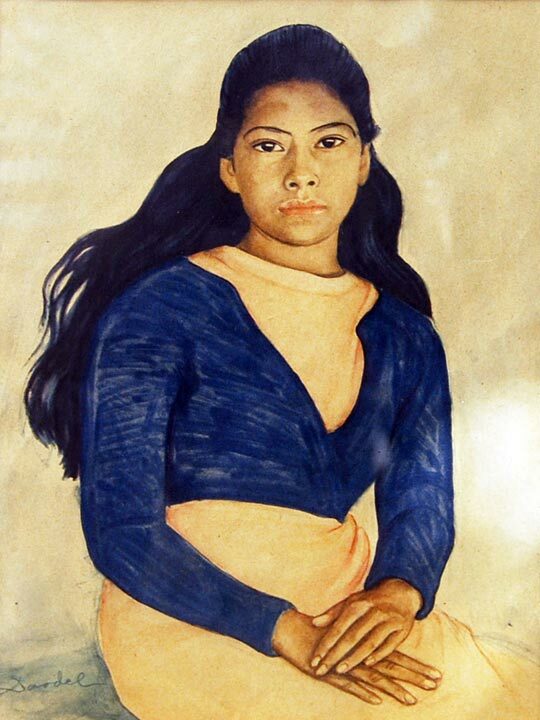 Mason lived in Pasadena, California, from 1917 to 1931 and briefly ran an art school there. 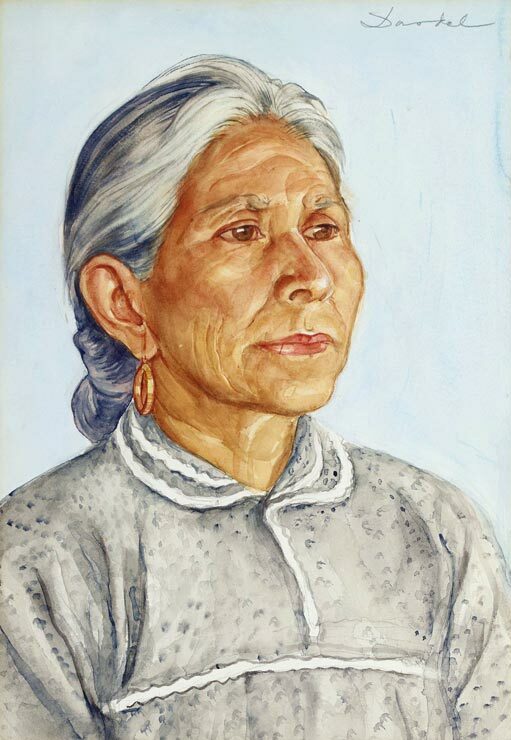 She was a co-founder of the Laguna Beach Art Association in 1918 and a member of the Pasadena Society of Women Painters & Sculptors, serving as its president in 1928. 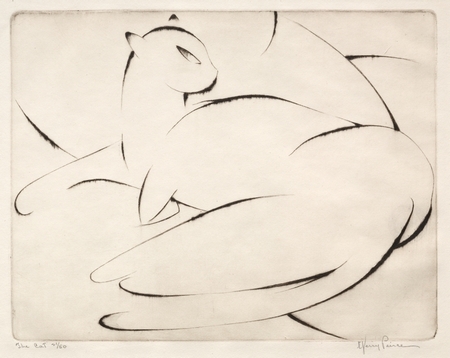 Her work was exhibited at the Laguna Beach Art Association (1921, 1924), West Coast Arts, Incorporated (1923), the Pasadena Women Painters & Sculptors (1928) and the Santa Cruz Art League (1929). She was also a member of the British Water Color Society. The precise circumstances surrounding her decision to move to Mexico and marry Alex von Mauch are unclear. Romance must certainly have been in the air; later that year, in Guadalajara, Eleanor married Leif Clausen, a Danish-born and educated artist and writer based in New York. 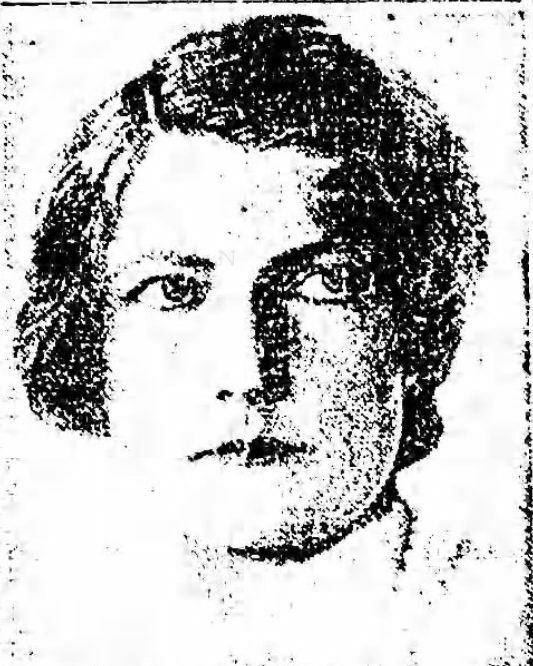 The notice of her marriage in the Los Angeles Times described her as “Mme Eleanor Mason von Mauch” of Laguna [Beach], and said that she was a member of both the Laguna Beach Art Association and the British Water Color Society. After her marriage to Clausen, Eleanor’s trail goes cold and nothing further has come to light about her life and legacy. El Informador, 3 May 1936, 4; 8 May 1936, 4. Los Angeles Times, 25 Dec 1921, 36; 31 July 1935, 30; 26 Sep 1937, 66. Santa Ana Register, 10 Mar 1923, 14; 12 January 1924, 5. Nils Dardel. ca 1940. 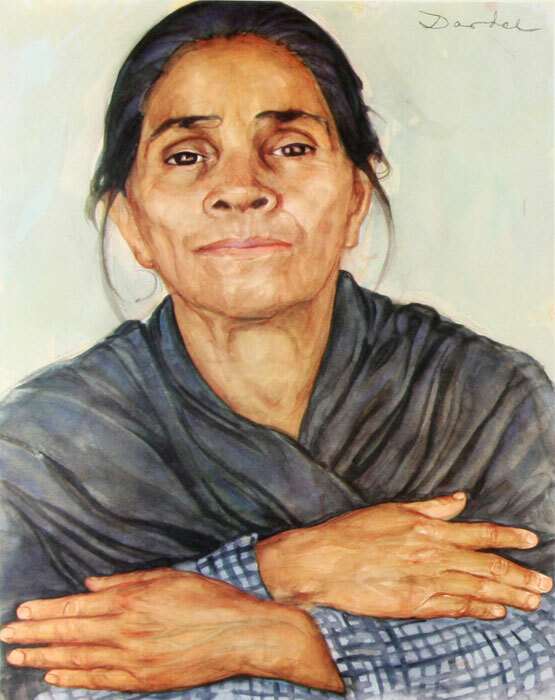 Mexican lady. 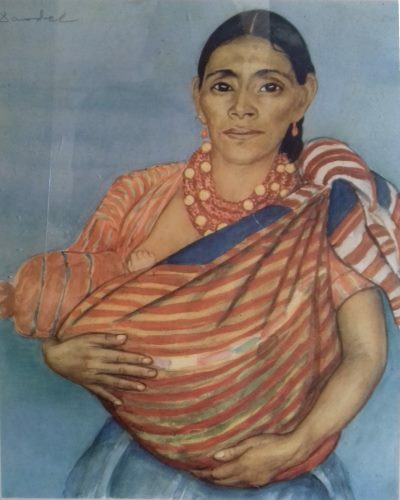 My sincere thanks to Mona Lang for first bringing Dardel’s connection to Chapala to my attention, and to Annabel Florman (see comments) for providing the last two images. 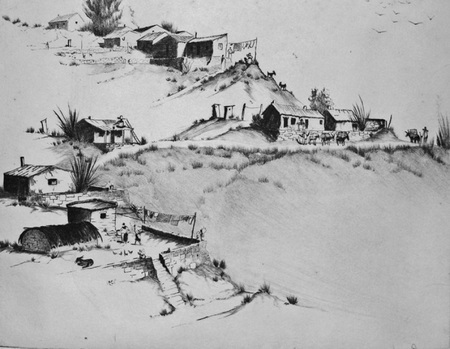 Richard D. Yip is included in the large group of artists associated with Lake Chapala on the strength of a painting entitled “Facade, Chapala, Mexico” which he exhibited in the All Southern California Art Exhibit in Long Beach, California in 1952. Sadly, beyond that, I have managed to find nothing more relating to his visit or visits to Lake Chapala. Yip was born in Canton, China, in 1919. He emigrated from China to the U.S. in 1931. After completing high school, he studied at the California College of Arts and Crafts in Oakland. After serving as a gunner and radioman on a B-24 in the U.S. Air Force during the second world war, he returned to California and settled in Stockton, where he studied at the College (later University) of the Pacific in Stockton for his B.A. and at the University of California at Berkeley for his Masters degree. Yip was the first Chinese person to receive American citizenship because of military service. Richard Yip. San Rafael. 1944. 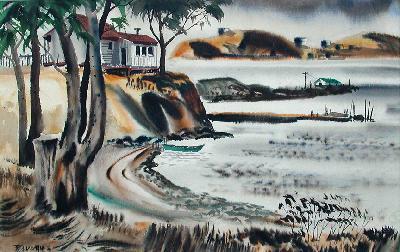 By early 1947, Yip was living and working with fellow artist Craig Sharp on a yacht, the Lassen, in Sausalito harbor. 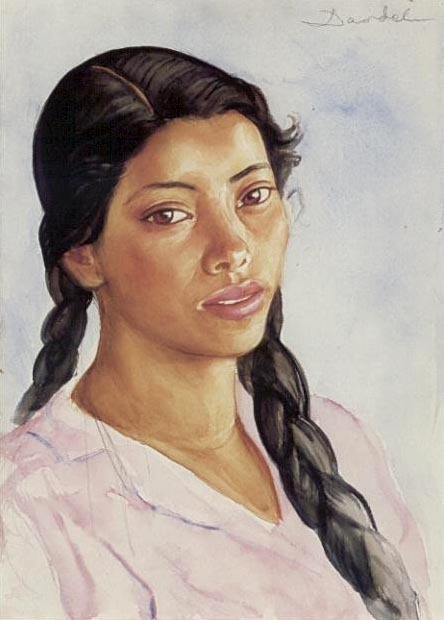 Yip was already working in watercolors and held solo shows which attracted positive reviews. 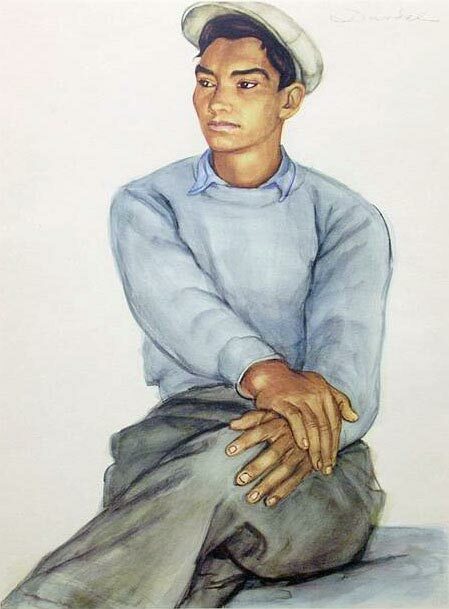 Later that year he left California to return to China to see his family and study art there. He visited various cities and amassed a body of work that he brought back to California with him in 1948. While in China, Yip married a girl named Lae. 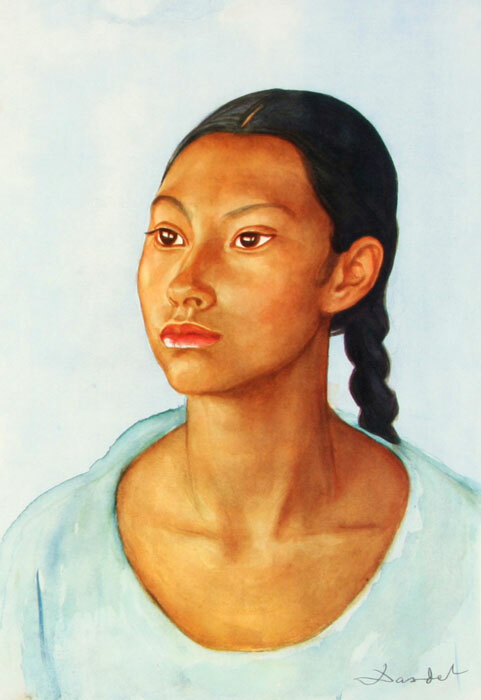 The couple’s first child, daughter Pak Mui (“White Blossom”), named after a boat Yip had admired in Sausalito harbor, was born aboard ship en route back to San Francisco. Perhaps not surprisingly, U.S. immigration officials initially denied entry to the mother, who spoke no English, and daughter, but they were eventually allowed to remain and were able to join Yip and other members of his family in Stockton. Yip hoped to show some of his work at the state fair in Sacramento in September 1948. 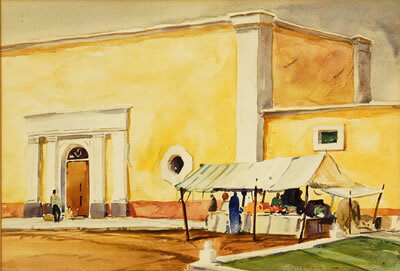 Presumably, it is at this stage of his career that Yip spent some time in Mexico, including a visit to Chapala where he painted “Facade, Chapala, Mexico”. Yip maintained links to Sausalito and spent many summers painting in Marin, where he was a member of, and gave talks to, the Marin Society of Artists. 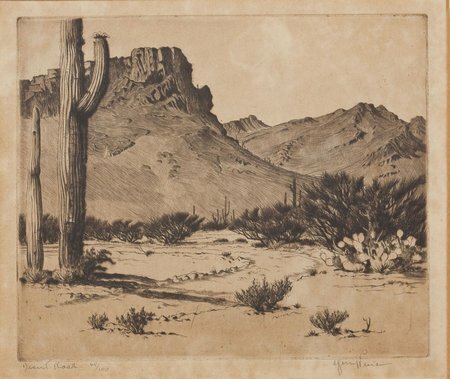 He was also a long-time member of the California Water Color Society. By 1961, the build-up to a talk by Yip on “some of the trends in contemporary art” says that Yip “has conducted painting classes at the College of the Pacific, Stockton College, the annual Monterery Peninsula Painting Tours, Death Valley Tours, Marin County, San Francisco, Santa Barbara, the East Bay, Phoenix, Arizona, Sacramento, San Jose and other places for the past 12 years.” By that time, his work had appeared in several national publications, and his watercolors had won various national and international awards. Yip was also elected a Life Member of the International Institute of Arts and Letters of Switzerland. 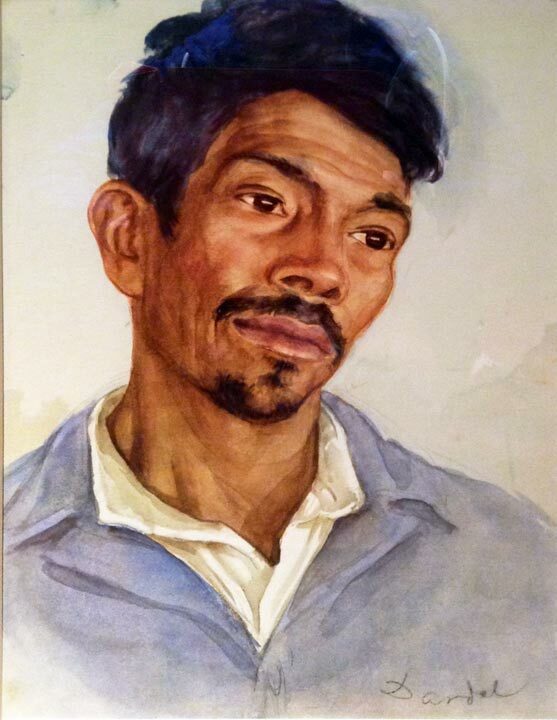 It appears that Yip retired from college teaching at about this time, though he continued to lead painting tours, including at least one to Mexico in 1963. (In January 1964, another Stockton artist, Marjorie Tanner, gave a talk to Lodi Art Club about the tour, led by Richard Yip, she had undertaken in Mexico. Richard Yip died in 1981. Several works by Yip have been sold at auction in recent years, including ‘The Red Church’ sold at Bonhams, Los Angeles, in 2011. Independent Press-Telegram, Long Beach, California, 9 March 1952, Page 8. Gordon T. McClelland and Jay T. Last. “California Watercolors 1850-1970”. CalART.com. Richard D. Yip (Biography from CalART.com), based on interview with Roy Yip, 1985. Catalan artist and writer Avel-lí Artís-Gener, who often signed his art simply “Tisner”, left Spain for exile in Mexico following the Spanish Civil War (1936-1939). 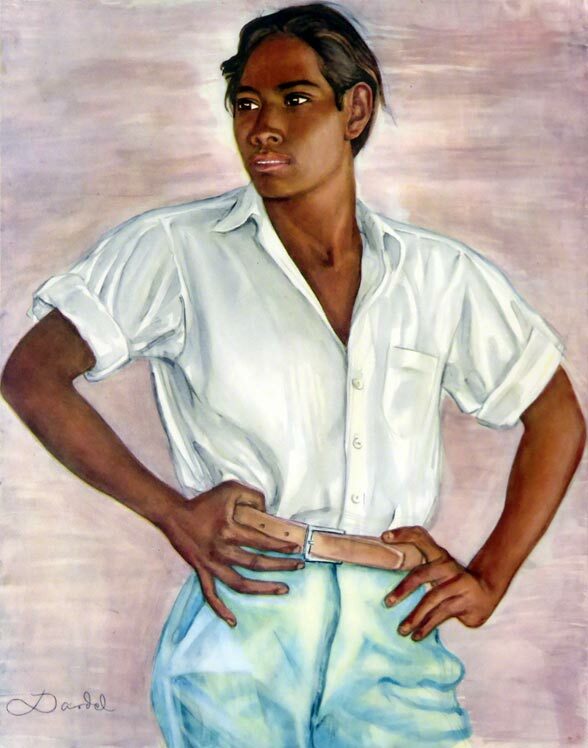 He lived in Mexico for 25 years, and visited and painted Lake Chapala in the early 1940s. 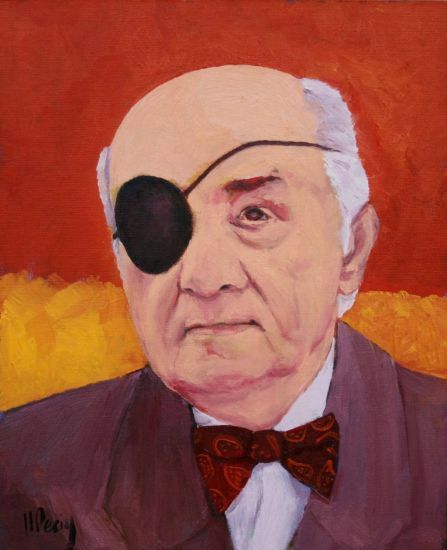 Tisner was born in Barcelona, Spain, on 28 May 1912 and died in that city on 7 May 2000. Artís-Gener exhibited numerous times in Mexico City. 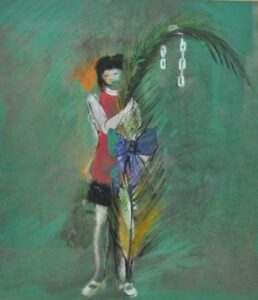 His work was included in a group show for the 4th National Floriculture Exhibition in May 1945, and a painting entitled “Chapala” featured in his third solo exhibit in Mexico City in the first half of September 1946, in the vestibule of the Cine Mageriti. Artís-Gener has another interesting link to Chapala. 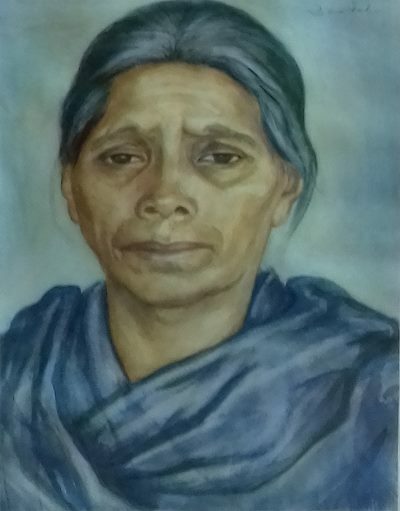 One of his students for watercolor classes was Conrado Contreras, who has since produced, among other works of art, numerous fine watercolors of the Lake Chapala area. Contreras and his wife (poet, writer and educator Zaida Cristina Reynoso) moved to Chapala with their two young children in 1975, and have lived here ever since. As a young man in Spain, Tisner had articles and cartoons published in a variety of media, including El Be Negre, Mercantil, l’Opinió, La Rambla, Esport i ciutadania and La Publicitat. At the start of the Spanish Civil War, Tisner received death threats and fled to Paris. Soon after, he joined the Republican Army and returned to fight. During the war, Tisner edited Meridià, Amic and Vèncer, magazines written for the combatants. During his time in Mexico (from 1940), Tisner worked as a journalist, cartoonist and scenery designer for Mexico City’s Channel 4, as well as working in publicity and as an editor. He retained close links with other exiles from the Catalan community. His cartoons appeared in Full Català, Quaderns de l’Exili, Revista de Refugiats d’Amèrica, Lletres, Pont Blau, Tele-revista, La Nostra Revista (founded by his father), and its successor La Nova Revista, founded by the artist himself. Tisner took particular interest in Mexico’s pre-Hispanic past, which was the motivation behind his best known book, Paraules d’Opòton el Vell (1968). Other works written by Tisner (he almost always wrote in Catalan), include 556 Brigada Mixta (1945); Prohibida l’evasió (1969); L’Enquesta del Canal 4 (1973); Les nostres coses (1978); Els gossos d’Acteó (1983); and Ciris trencats (La Campana. In 1965, Tisner returned to Catalonia, where he worked initially as a journalist for the daily El Correo Catalán, and later became deputy director of the Catalan weekly Tele/Estel. In 1970 he translated Gabriel García Márquez’s Cien años de soledad into Catalan. During his later years, he worked for a large number of different newspapers and magazines, including Avui, El Periódico, Catalunya Informació, L’Avenç, Serra d’Or, Canigó, Cultura, El Triangle, El Món, Presència, and Espais mediterranis. Tisner was politically active in the 1980s, and in 1988 received the Creu de Sant Jordi, one of the highest civil distinctions awarded in Catalonia. He also won a City of Barcelona prize for Catalan prose. He was a founding member of the Association of Catalan Language Writers, and the group’s president from 1990 to 1994.